We have a loyal customer base because of the quality of the Brewers product range and the exceptional service and support of our long-serving local team. We take the time to get to know all of our regulars by name, go out of our way to match colours and provide the very best service. The store has a wallpaper showroom which features a kids’ range, as well as a good selection of trade and designer paints. You can pick up a drink for free from the machine while you browse, and there are customer toilets in-store too. 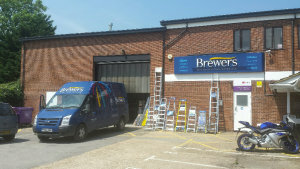 The Brewers Decorator Centre in Staines is a little bit tricky to find unless you use these directions – but it’s well worth the effort. We’re on Gresham Road, which leads off the B376 Laleham Road and meets Kingston Road at the top. We’re only a two-minute walk from Staines railway station. Gresham Road is largely residential and the driveway to our decorator centre is in between two houses on your left, ten yards before the mini-roundabout when you approach from the Laleham Road end. There’s customer parking directly outside and the store is fully accessible for wheelchair users. From the A308 heading on to the B376 Laleham Road, take the third turning on the left on to Gresham Road. Before reaching the mini roundabout at the end of the road, the turning to the store is on the left. Approaching from the B376 Laleham Road, the turning to the store is on the left before the mini roundabout. From Budebury Road, at the mini roundabout take the first exit and the turning to the store is immediately on the right. Once over the mini roundabout on to Gresham Road, immediately take the turning on the right to find the store. From B376 Laleham Road travelling towards the A308, turn right on to Gresham Road. Before reaching the mini roundabout at the end of the road, the turning to the store is on the left.